The February Daring Cooks' Challenge was hosted by Audax of Audax Artifex. 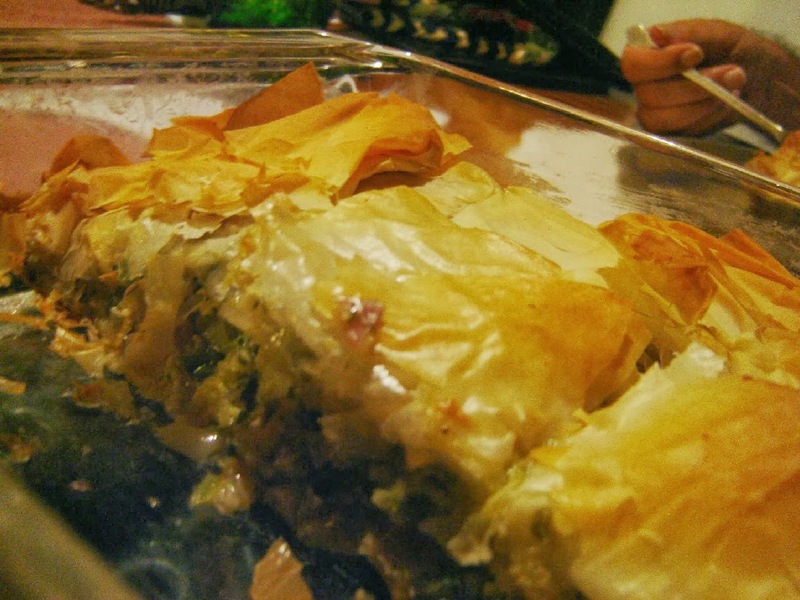 The challenge brought us to Greece with a delicious, flaky spanakopita - a spinach pie in a phyllo pastry shell. I do believe I've made Spanakopita, sometime in the distant past. But, this recipe is probably new for most of us, even though actually the more traditional version. Audax got it from his neighbor, Mrs. Maria, and it combines dill and four kinds of onion with the spinach. Also, instead of cooking the ingredients before filling, they are massaged. I liked that a lot. Nothing like a nice massage. Besides which it saves a pan and time. My camera did not pick up the vivid green of the spinach/dill filling, so I am disappointed with the photos, but the dish was delish, super duper in other words. The various onions meld with the spinach (chard in my case) and feta cheese. Also, this recipe uses less cheese than most modern versions, and I much prefer it. I have had a terrible time on the few occasions I've used phyllo pastry in the past, with it clumping, pulling apart, and generally making a mess. This time I thawed it (the chilled type recommended was not available here) in the fridge for two days before using, and had no problems. I am transmitting the recipe as given, but just so you know, I took a shortcut, in not squeezing the liquid out and adding the breadcrumbs separately. I just added them until the moisture was taken up sufficiently, and it worked fine. One step less is good in my book. Oh yes, I also skipped step 15, by mistake, but as things turn out, the extra sheets of phyllo on top were superfluous (in my humble opinion), unless your pastry does not meet and completely cover the top. I used an 8 inch square pan, so it all got covered. 2. Wash the spinach and dry thoroughly, discard the tough stems, chop or tear the leaves into pieces, place into a large bowl. (If using thawed chopped frozen spinach just place into a large bowl). 3. Add the chopped onions, chopped leek, finely chopped dill, four tablespoons of extra virgin olive oil, the crumbled feta cheese and the optional garlic and nutmeg. 4. Using your hands vigorously massage the filling ingredients until the mixture loses about half to three-quarters its original volume. 5. Over a bowl or a large plate squeeze large handfuls of the mixture till they feel dry, continue until you have done all of the filling mixture, and you have collected all the excess liquid. 6. Cover the excess liquid with enough breadcrumbs, cous cous or cracked wheat (or similar) to absorb the liquid. The breadcrumbs should be moist. I used ¾ cup of cous cous and it took about 5 min.s to absorb nearly all of the liquid. 7. Return the moisture-laden breadcrumbs back into the filling mixture. 8. Add an egg (or two depending on how dry the mixture is) and mix well using your hands. Taste, season with some salt (careful feta contains lots of salt) and plenty of pepper. Set aside. The filling can be stored in the fridge for a day or two if well covered. 9. Butter (or oil spray) the baking dish. 10. Cover the phyllo sheets with a damp tea towel. 11. Cut (with a knife or with scissors) the phyllo sheets to the correct shape for your baking dish. Cover the cut sheets with the damp tea towel until needed. 12. 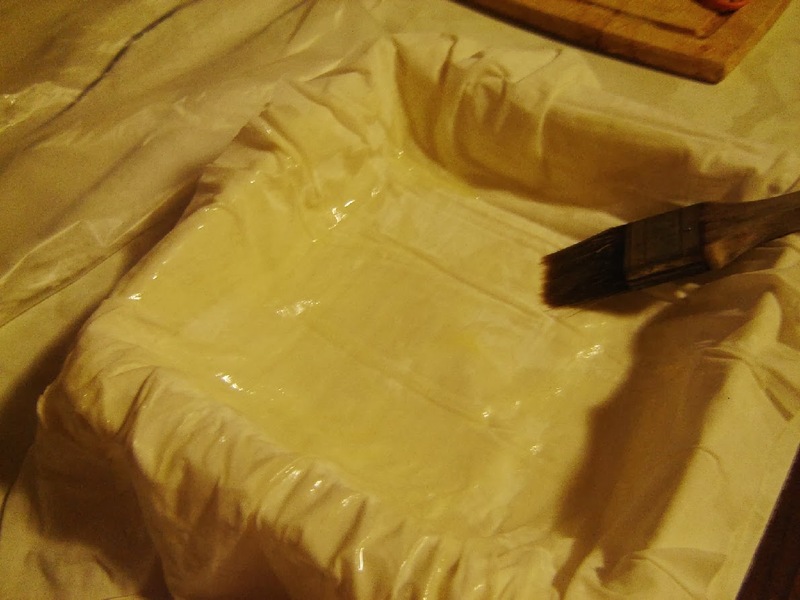 Butter (or oil) every second sheet, cover the base and sides of your baking dish making sure that the sheets overhang the edges of the baking dish. Use about ten “thin-style” phyllo sheets or about six “thicker-stye” phyllo sheets for the base and sides. 13. Spoon the filling into the phyllo pastry case. 14. Fold the overhanging sheets over the filling. 15. Use four to six more “thicker-style” phyllo sheets or about eight “thin-style” phyllo sheets to cover the top, butter each layer. Use a spoon or similar to neaten the edges of the pastry case. 17. Bake in a preheated moderately hot oven for 30 mins up to one hour (depending on the depth of your baking dish). Cover with foil if over-browning. Mine took one hour and my dish was almost 6-inch (15 cm) high. Check for doneness by using a thin knife, insert it into the spanakopita for 30 secs, the filling should feel set and the knife should feel hot to the touch. 18. Cool for 30 minutes. Can be eaten hot or cold. Oh dear, we were too impatient to wait 30 minutes for it to cool. Didn't seem to suffer for it. Sooooo good. Love this method, and it was surprisingly quite easy to make. Of course I had dreaded working with phyllo again. Last time I swore never more. But, thawing first in the fridge really seemed to help, unless this was just a better brand. You might want to see the other versions at the Daring Cooks site.